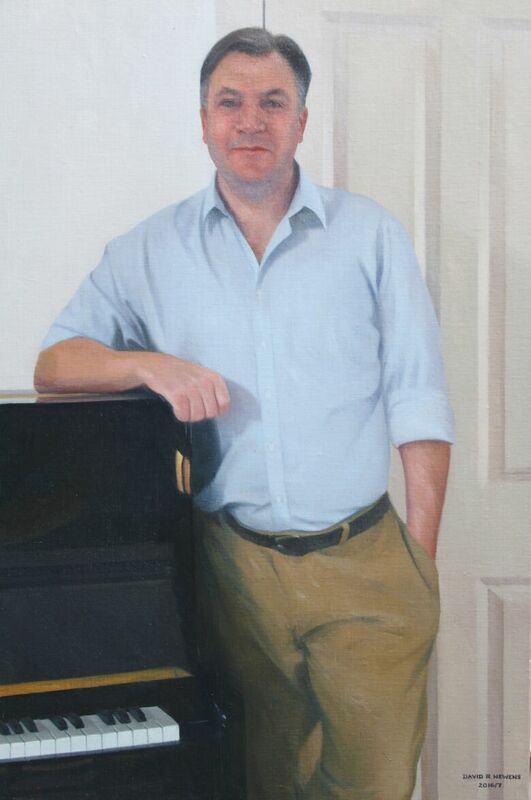 A portrait commission needs to be considered as a joint project of the artist and the sitter, with the objective of meeting the expectations of the client (possibly the sitter, but often a relative, company or institute). I vary my approach considerably and I am prepared to be flexible to meet the requirements of the client. For example, an institute may specify very precise requirements regarding size, format, dress, etc. in order for compatibility with other portraits. Nevertheless, even within tight specifications, my aim is not solely to achieve a satisfactory likeness, but to produce a good painting in terms of composition, colour harmonies and tonal balance. I am happy to paint 100% from life; solely from photographs (subject to satisfactory photographs); or, more often, from a mixture of both life and photographs. As the sitter may only be able to commit a limited amount of time to the project, this factor can dictate the approach. My preference is to undertake at least a life study of the head. This provides for better colour information than any photographs. Rather than a purist, time consuming for the sitter, life painting of clothing and folds (which change every time the sitter has a break), I would generally work these elements up from photos. This can be at a location determined by the client/sitter or at my studio in Milton Keynes. The majority of clients/sitters wish to be painted in their own surroundings. I like the challenge of painting in different locations. A key issue I would stress is lighting. Wherever possible, natural consistent lighting is preferable i.e. light from a window facing in a northerly direction. Artificial lighting tends to give a warm cast and the cooler colours in the subject are lost. From this information, I will then be able to let you know a proposed approach, timescale and price. For a complex portrait, an initial meeting may be necessary to clarify requirements. I am available to work anywhere in the UK.